September 9, 2017 – A 16 feet 11 in saltwater crocodile was captured by fishermen in Tawi-Tawi, an island province in the Philippines on Friday morning (September 8, 2017). According to the local resources, a local fisherman first spotted the crocodile on Tuesday, but initially they thought it was a wooden log. But it moved when he approached it. Then he reported the incident to the officials, and an operation has been conducted to catch the crocodile. A lot of fishermen and officials involved in, since the giant crocodile was very aggressive – it wrecked a boat and damaged a number of fishing nets during the operation. 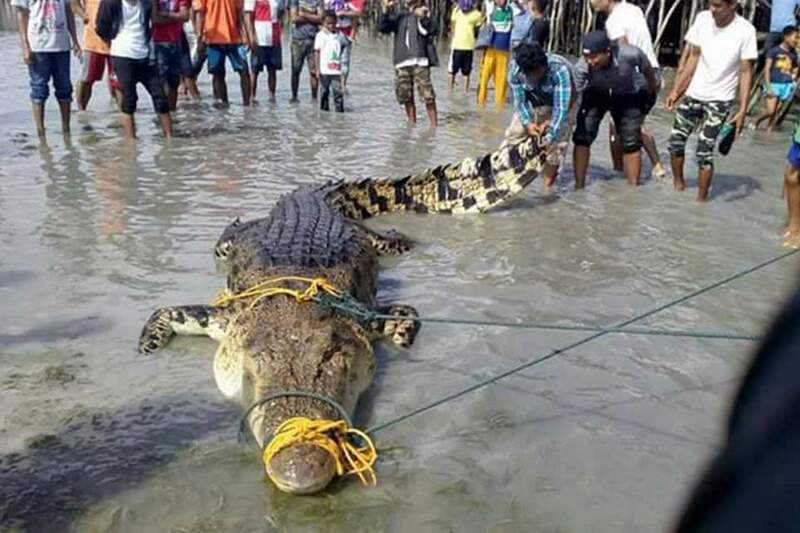 Ruben Balcorza of the Municipal Disaster Risk Reduction Management Office of Simunul, Tawi-Tawi said that the crocodile is now under the care of the municipal government. Killing a crocodile is a crime in Philippines that has a fine amounting to P100,000 pesos (around $2000) and imprisonment of up to six years.